Arms recovered by police in an uncompleted building in Ajah area of Lagos. Police recover fire arms in an uncompleted unoccupied building in Osapa London area of Ajah, Lagos. The police in Lagos continue to make decent successes in their quest to rid Lagos of illegal arms and ammunition. 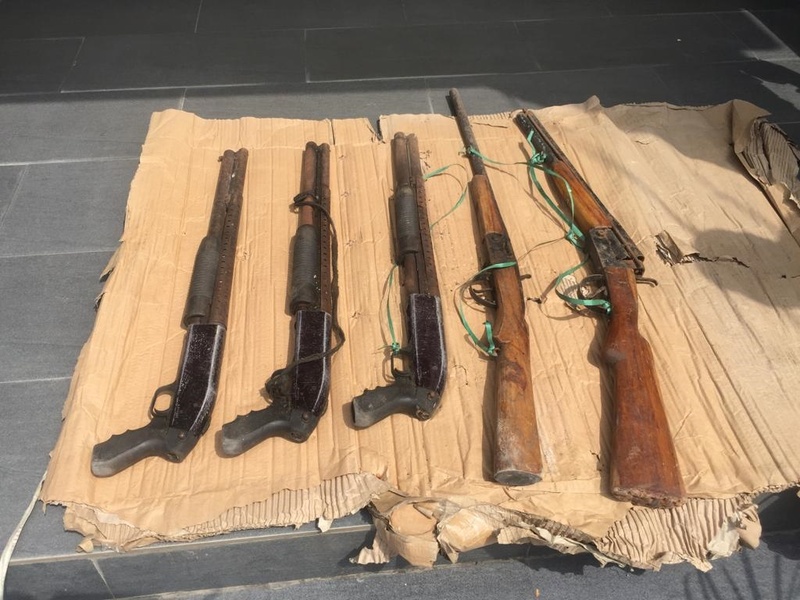 The latest is the recovery of five rifles inside an unoccupied shanty located at Road 1, Block 1, Plot 7, Victory Park Estate, Osapa London, Ilasan on Friday, November 9. The Command's taskforce on recovery of illegal and prohibited firearms, attached to Area J Command Headquarters, Ajah, made the recovery during their raids of uncompleted, unoccupied houses and plots of land. The CP has directed the ballistic arm of the SCIID Panti Yaba to commence investigation into the case. He gave the assurance that the ember months will remain peaceful in Lagos as the Command will continue to carry out intelligence and purpose driven raids on all identified criminal spots in the state. The CP added that the Command would continue to enforce the Inspector General of Police directive on mopping up of illegal and prohibited firearms; warning that anybody found in possession of such weapons will be diligently prosecuted. Similarly, at Elemoro, 11 armed robbery suspects were arrested at their hideout. Upon searching their den, detectives recovered one berretta pistol and two locally made pistol. The Police Public Relations Officer, CSP Chike Oti, has promised that progress made in the investigations will be made public.